Can the weather predict consumer behavior? Do Print options still work, in the digital age? Does Retweeting help your brand? Your hashtag strategy should change! Every one who sells, services, or promotes your brand whether across the country or across the globe is a brand ambassador. Our marketing software sits in the cloud helping to execute and manage their local direct mail and email campaigns, collateral printing, microsites with SEO and landing pages, and social media posts without ever compromising your brand. And provides all the enterprise reporting you’ll ever need. 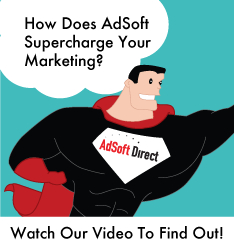 AdSoft Direct creates marketing centers that drive new business, improve customer loyalty, and connect you with the most important part of your business: your customers.